Have you had a chance to try the pumpkin spice marshmallows? Run to the store and buy yourself a bag. Try one. Now put one in your hot chocolate. Good huh? Okay, scratch that…you are going to need two bags of the pumpkin marshmallows. 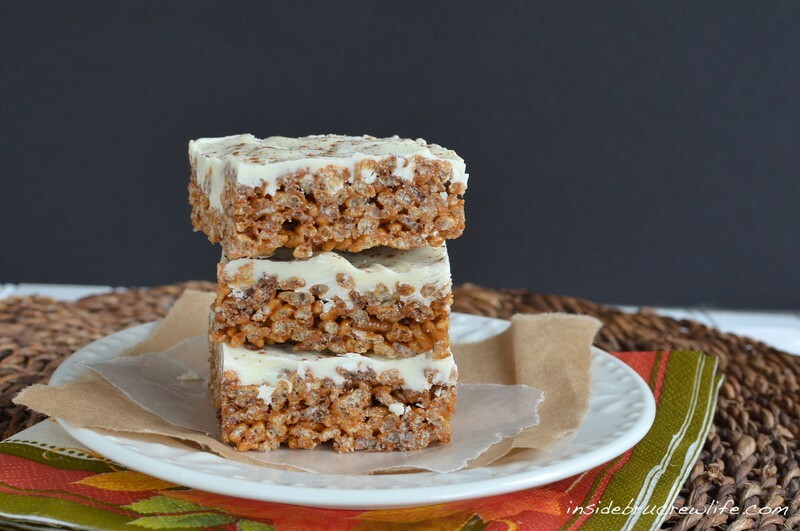 One to enjoy in your hot chocolate and one to make these Pumpkin Spice Latte Krispie Treats. I was going through some old pictures and realized that I never shared these bad boys with you last year. That’s not cool! Last year I participated in Carrie’s Pumpkin week. 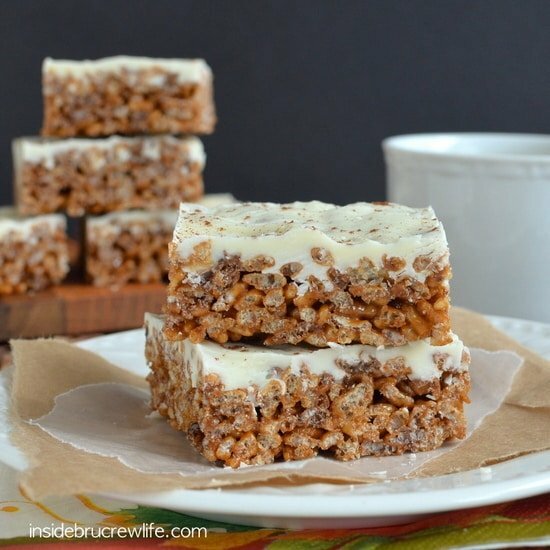 I just adore that orange stuff so much, so I was all in for creating these fun pumpkin spice latte rice krispie treats to share there. 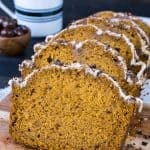 Pumpkin is seriously my favorite thing to bake with the entire fall season. Something about the smell coming out of my kitchen gets me every time. Especially when it is in things like this Pumpkin Chocolate Chip Bread and these Butterscotch Pumpkin Whoopie Pies. Pumpkin goodies just disappear around me when I start baking with it. This is actually kind of a cheater pumpkin dessert because instead of real pumpkin, I used those pumpkin marshmallows. Then I added some coffee and white chocolate to jazz it up some! Boom!! 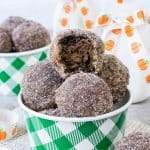 These are now full of pumpkin latte flavor. 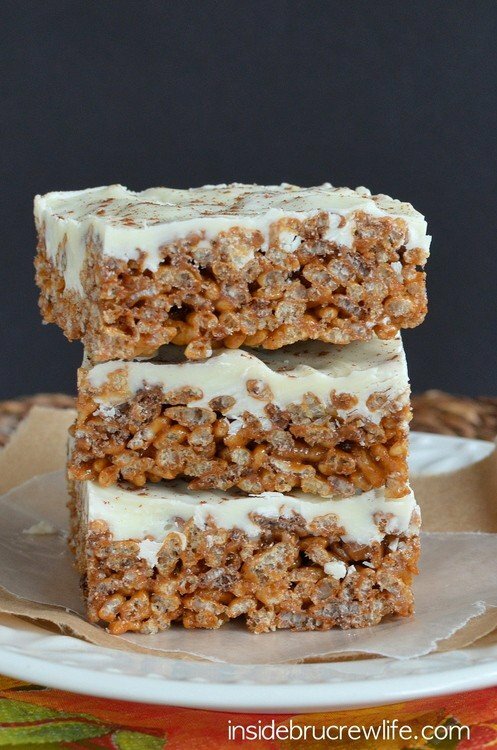 Talk about a rice krispie treat that you can’t stay out of. I have another bag of the pumpkin marshmallows in my cupboard just begging to be used in these again. I don’t know what I’m waiting for!!! In a large saucepan, melt the butter. Add the instant coffee and stir until dissolved most of the way. (It will continue to dissolve as you keep heating the ingredients.) Add the marshmallows and stir until completely melted. Stir in the rice krispies until they are coated. Press very lightly into the prepared pan. (Do not press hard or you will have hard treats.) Let cool and set. In a microwave safe bowl, combine the white chips and shortening. Heat for 30 seconds and stir. Repeat until the chips are melted and smooth. Spread over the top of the krispie treats. 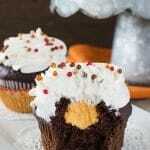 Sprinkle with a light dusting of pumpkin pie spice. Let set before cutting into 24 squares. Store in a sealed container. You definitely need to!! 😉 Thank you! I just had my first pumpkin spice latte (I know, I know:) and then you post this! 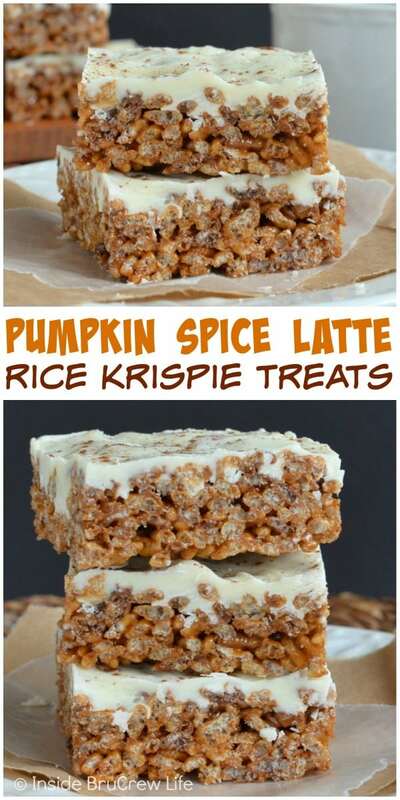 I must make this while I’m on my pumpkin latte kick! It looks delish! I haven’t seen the pumpkin marshmallows. I’ve added them to my list. 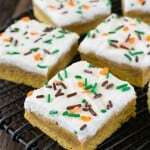 These krispie treats look delicious! I. Hope you find them soon! 😉 Thanks Stephanie! Oh goodness, there are all kinds! You need to head to the nearest baking aisle! 😉 Thanks Kelly! Woo hoo!! 😉 Thank you Carrie!! I hope you made these!! 😉 Thanks Chandra! Never even seen those marshmallows!! Must get them on amazon. 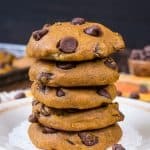 These look crazy good and such a fun spin on the pumpkin spice latte! You totally need these! They’re delish! Thanks girl! MORE PUMPKIN SPICE PLEASE! Heehee I can’t get enough. 😀 These rice krispie treats look to-die-for and are the perfect treat from now for forever (or at least til Thanksgiving!). 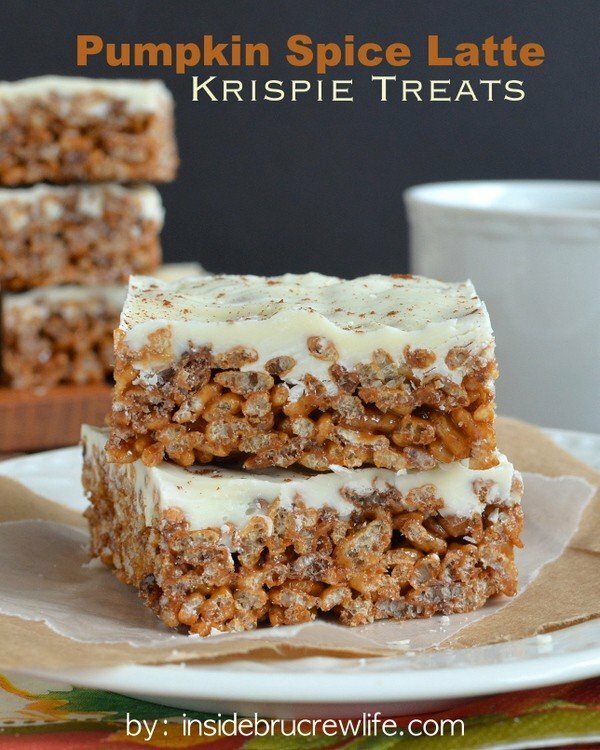 What a great idea for krispie treats! 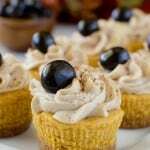 Perfect fall dessert for days like today when it’s still in the upper 80’s! Found this in Pinterest. Super yummy. Did not do the white chocolate topping thought it would be too sweet. Still gobbled them up!